Whose responsibility is it to manage EU VAT? Envato is responsible for determining, collecting and remitting EU VAT for all Envato Market purchases from EU customers. The EU VAT obligation is carried by Envato, you have no further responsibility to deal with EU VAT on sales made through Envato Market. Envato will report the VAT collection and remittance to the relevant EU member state authorities using our EU MOSS VAT registration. As of January 1st, 2015, the seller’s location does not make a difference, Envato is accounting for VAT on all sales into the EU based on the customers' location. Whose name is EU VAT collected and remitted under? EU VAT collected from customers will be remitted by Envato to the EU via our EU VAT MOSS in the UK in our name. 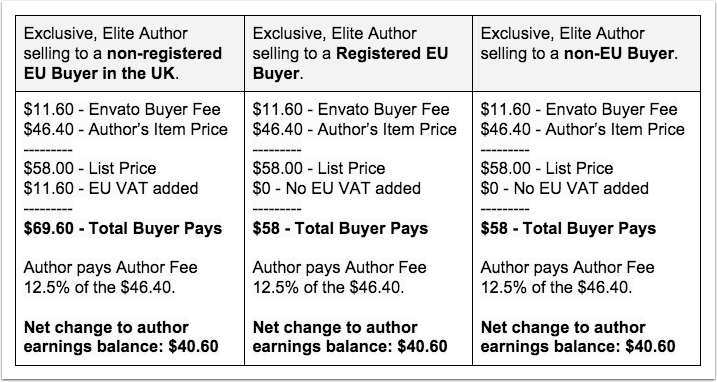 For clarity, EU VAT is not reported in the author’s name, and we do not require author EU VAT registration numbers or details. EU VAT is added to the list price for purchases by EU customers who don’t provide a VAT number. (Customers who have a VAT number will not be charged VAT, and should instead use the Reverse Charge Mechanism to account for the VAT). The item price (the amount the author receives) will remain unchanged. Moreover, the VAT won’t appear on your statement as it’s not the author’s responsibility or liability. 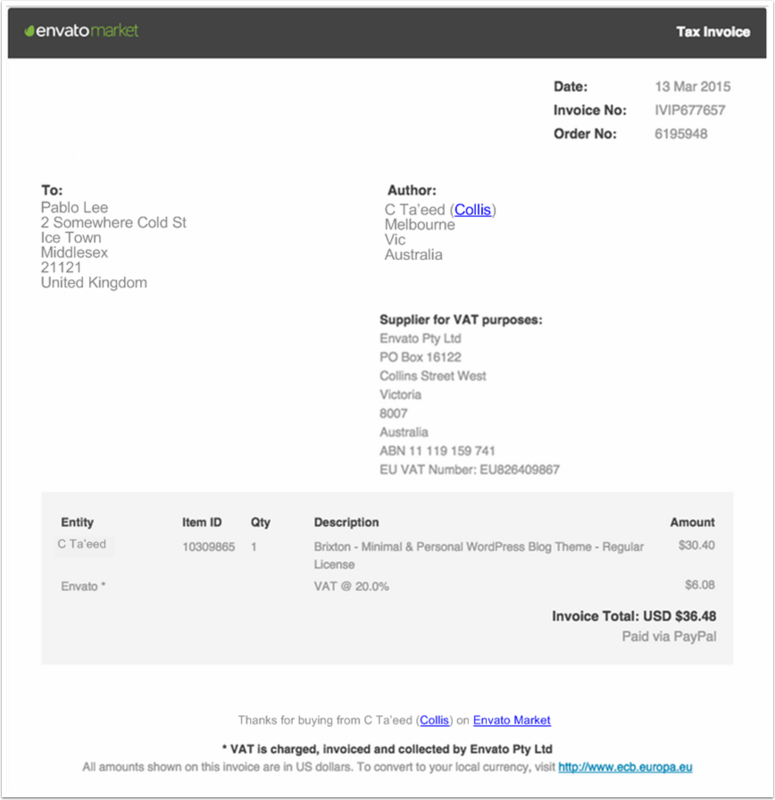 For EU VAT purposes only, Envato is shown as the supplier of record and our EU VAT registration number is listed on the invoice. EU Customers will use Envato’s details when accounting for their EU VAT. For non-EU Customers, the author is shown as the supplier. 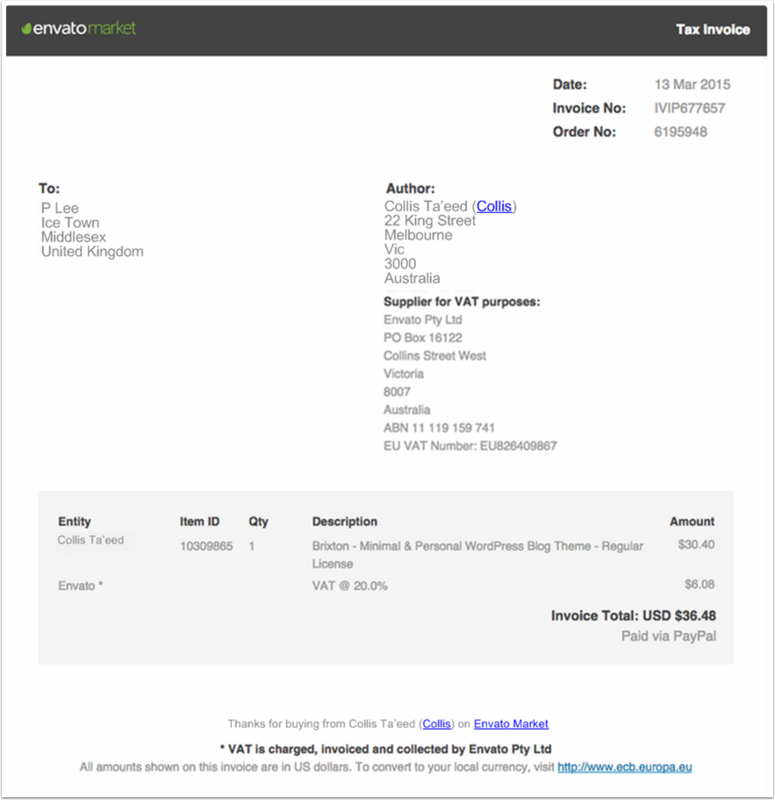 Why do Envato’s Service Fee invoices not show EU VAT? For EU VAT purposes only, Envato steps into the supply chain as the supplier on record. This means that for VAT purposes, an EU customer buys from Envato and EU VAT is accounted for on this transaction. As a result, for EU VAT purposes only, the author is deemed to have sold the item to Envato. Since Envato is not an EU entity, there is no further EU VAT applicable. For all other purposes, including selling to non-EU customers, and including income tax purposes, the author is selling directly to the customer and receiving a sale income. Subsequently, the author pays an author fee to Envato. You will receive a non-VAT service fee invoice for all author fees and you can use this for accounting for income tax. What about Non-EU VAT and other sales taxes? For Non-EU VAT and taxes outside of the EU, refer this section.